Anyone who’s operated a lift truck for any length of time understands the importance of forklift ergonomics, and employers are following suit. Lift truck operators can lose steam as the shift wears on. A tired or uncomfortable operator is less productive than a fresh, well-rested worker. To that end, we’ve seen a move toward lower-impact controls and swivelling seats. Forklifts now have electric power steering, automated pallet positioning, and even cruise control. Standing in the way of perfect ergonomics for forklift operators, however, is one of the very foundational aspects of any good ergonomics program: The goal is to match work to a worker, but what accomplishes that task for one employee won’t necessarily work for the next. The problem is worst at operations that run three shifts. You’ll have three workers (at least) on the same lift truck. How can the seat and controls perfectly match three potentially very different bodies? Don’t forget auxiliary tasks, such as changing forklift batteries. Most ergonomic interventions for forklift operators take place inside the truck, but there’s usually more to the shift than zipping through the aisles. Employers should provide safe, quick, and ergonomically enhanced means to change and maintain forklift batteries. 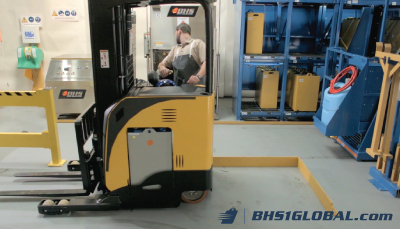 The gold standard for battery handling is a complete Operator Aboard Battery Extractor System, but even the addition of a few Battery Carts or Carriages — or a user friendly Gantry Crane System, if you lift batteries vertically out of trucks — will help keep forklift operators safe, comfortable, and free from frustrating delays. Choose trucks with adjustable seats. If the goal of ergonomics is to match the work to the worker, and your workers aren’t identical, then you need flexibility in your material handling equipment. Seats that adjust to different heights, weights, and body shapes will help keep every operator comfortable throughout the shift. And given the time that forklift operators spend carrying loads in reverse, chairs that can swivel can greatly reduce muscle strain at the end of a long day (or night, as the case may be). Get the right truck for the situation. Not every forklift cab needs to be fully enclosed and equipped with an adjustable thermostat, but if you run a cold-storage facility, you should definitely provide some heat within the truck. Go digital behind the wheel. Manual controls and mechanical gauges may not seem like they create much of a strain, but over time, they can take their toll. Newer digital screens allow users to control key aspects of the vehicle on a simple, well-lit, easy-to-read touchscreen. Forklift ergonomics continue to evolve, as manufacturers and end-users both experiment with more comfortable arrangements. In the end, though, the operation that provides a safer, less stressful workplace will retain more skilled operators, move the most freight, and win the most contracts. Forklift ergonomics is an important part of success in the warehousing industry. Bond, Josh. “Lift Truck Tips: Improving operator ergonomics.” MMH. Peerless Media LLC, 1 Mar. 2012. Web. 4 Feb. 2019. Bond, Josh. “Lift Truck Tips: Feeling the impact of ergonomic improvements.” MMH. Peerless Media LLC, 6 Jun. 2018. Web. 4 Feb. 2019.